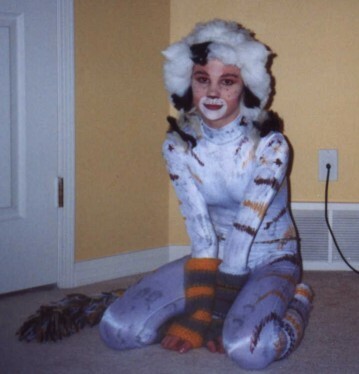 Now on to Grizabella's friends... the online Jellicles who've inspired me :-) While surfing Cats sites I've come across some incredible homemade Jellicle costumes. 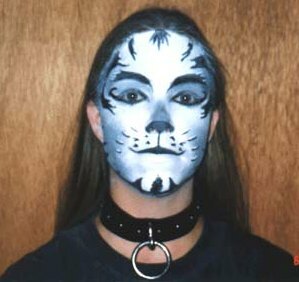 This page is my tribute to creative Cats everywhere. 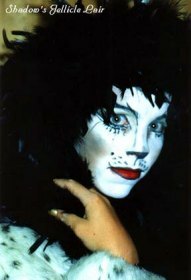 If you've made your own Cats costume &/or designed Cats makeup and you'd like your photo displayed here, email me at To visit these talented Jellicle Cats, check out their links under Cats Costuming Pages. Thanks to all who have donated their very cool photos to this page! 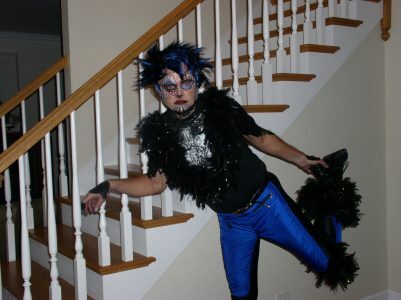 These elegant Jellicles are Craig and his friend dressed up for a party. Thanks for sharing, Craig! Thanks to KiraKitty for these amazing transformation photos. Great job! 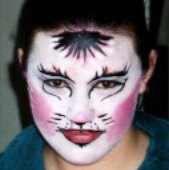 as Mistoffelees and in makeup as Grizabella. 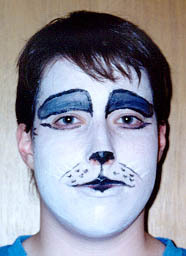 Below: Robbin came up with this very cool, very original Jellicle design. 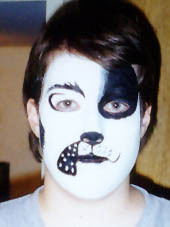 David Counterman is a puppeteer and a CATS fan. 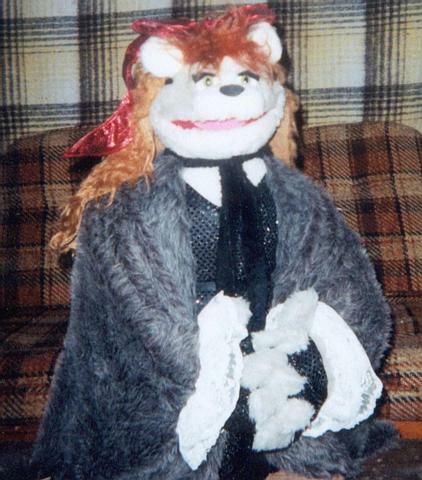 He designed and made this adorable Grizabella puppet himself. 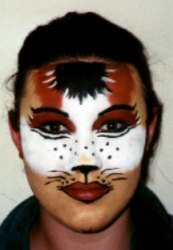 Cheek art, animals, Halloween art, clowns, body art--more than 83 designs for face-painting with complete how-to instructions in a spiral-bound book that comes with one set of nontoxic, water-based Kryolan face paints and brush. 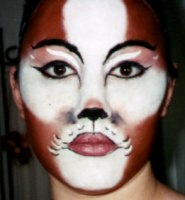 Not a "professional" book on stage makeup, but fun and easy for beginners. 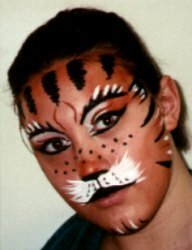 The Complete Guide to Basic Makeup, Planning and Designing Makeup, Adding and Reducing Age, Ethnic Makeup, Special effects. 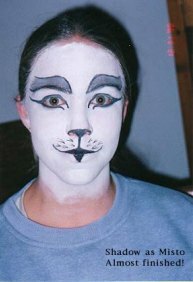 You can use this book to improve your own makeup skills or for teaching basic theater makeup. With clear photos and step-by-step directions, this is an excellent all around book, and a wonderful professional-caliber introductory book as well. High school, college, and community theatre versions of Broadway shows can have all the glitz, glitter and pizzazz of the New York variety. 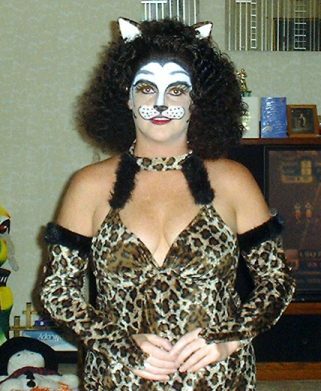 This book lists 100 famous musicals categorized by costume styles. 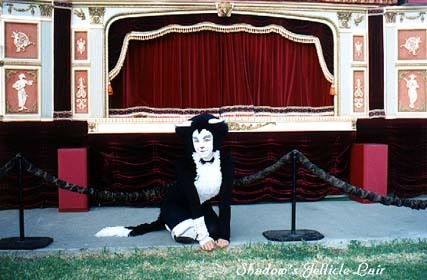 Applying the book's crossover system, costumes from one show can easily be altered for any other show in the same category. 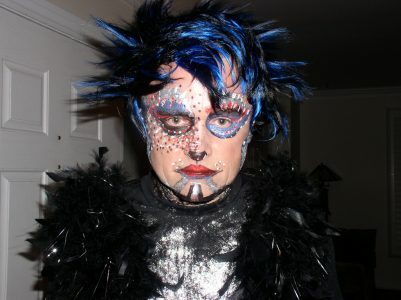 "How to do it" suggestions are given for both the basic costume design and for specific show adaptations. 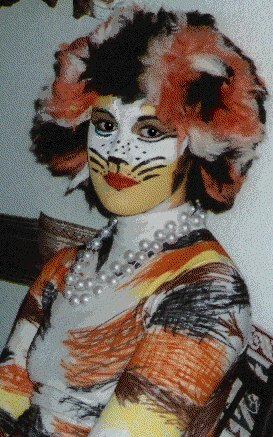 Cats the musical & cast photos copyright The Really Useful Group Ltd.